The Mad Farmer’s M.O.A.B. 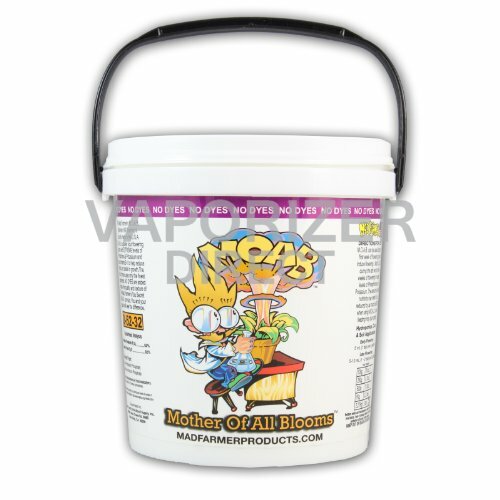 (Mother of All Blooms) is a bloom enhancer and ripening agent. With a 0-52-32 NPK, M.O.A.B. supplies your plants with extreme levels of phosphorus and potassium. The potent formula is designed to increase the size and density of your harvest. It also stimulates the production of essential oils, aromas and flavors of your fruits and flowers. M.O.A.B. can also be used during the first week of flowering to jump start the bloom cycle. Mono Potassium Phosphate – a synthetic fertilizer that is processed by mixing phosphoric acid with potassium chloride and then heated to remove all traces of hydrogen and chloride. It is used widely as a fertilizer when high levels of phosphorous and potassium are needed. Mono Ammonium Phosphate – a synthetic fertilizer formed when phosphoric acid is mixed with ammonia. It is mainly used in the blending of dry agricultural fertilizers. It supplies Nitrogen (11%) and Phosphorous (52%). Thiamine Hydrochloride (Vitamin B-1) – a B vitamin which helps plants resist transplant shock and assist in growth. M.O.A.B. can be used during the first week of bloom to help induce flowering. Add M.O.A.B. during the last two to three weeks of flowering for added levels of phosphorous and potassium. Combine 1-2 teaspoons of M.O.A.B. per 5 gallons of feed water. The amount of base nutrients may need to be reduced by as much as 50% when using M.O.A.B., over feeding may burn plants.Synthetic fertilizer that is processed by mixing phosphoric acid with potassium chloride and then heated to remove all traces of hydrogen and chloride. It is used widely as a fertilizer when high levels of phosphorous and potassium are needed. Synthetic fertilizer formed when phosphoric acid is mixed with ammonia. It is mainly used in the blending of dry agricultural fertilizers. It supplies Nitrogen (11%) and Phosphorous (52%). B vitamin which helps plants resist transplant shock and assist in growth.